Agriculture is one of the oldest sectors of humanity. One-third of the Earth's land is used for agriculture. In the Neolithic period, ie at the end of the last ice age, began the first primitive approaches of agriculture, with tools such as the furrows floor or the harvesting knife. The agrarian society replaced the hunter-gatherer communities and was formed about 12,000 years ago. The domestication of crops and livestock was so far advanced that the people organized their work mainly as farmers or ranchers. As the members of the agricultural society except the pastoralists are mostly sedentary because of soil management, larger stocks can be compiled to physical assets and built. 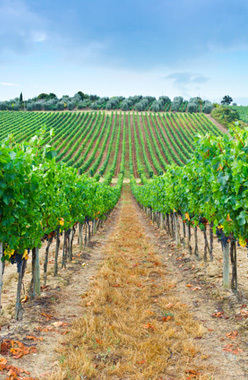 Crops are preferably intended for export products such as wine, tobacco and olive. The main areas for growing wheat are the regions of Thessaly, Western Thrace, Boeotia and Macedonia. The animal husbandry in Greece is concerned mainly with the breeding of sheep and goats. For the cultivation of fruit and vegetables the soil of Greece is suitable; so grow grapefruit, soy, avocado and asparagus. Due to the maritime character of the country fishing and fish farming in Greece is assigned a specific role. Agricultural production in 2007 has about one-third of the workers of Greece. Since the economic crisis (2009), the number of farmers has risen by 40,000 within two years. Most new farmers operate organic agriculture and / or specialize, for example, the snail farming or the production of truffles.